Welcome to the Assembly online press room! 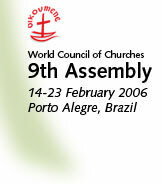 Below is an easy-access index of the 9th Assembly's statements, main documents, reports, and presentations as well as information on the new WCC central committe and presidium. "God, in your Grace, Transform the World"
Please find below two-page documents ('press dossiers') with concise information about some of the relevant issues at the WCC's agenda.